BEACH FRONT ESTATE, STEPS TO KAILUA BEACH, PRIVATE HOME ON AN ACRE, BEACH VIEWS! Our beach estate is located on over an acre of land, just steps to the best white sand beach in Hawaii, constantly rated as one of the top 10 beaches on earth. This is the only beach in Hawaii to consistently show up on all top ten beaches in the world lists. Unlike most beaches in Hawaii our beach is mostly free of tourists so you can actually have space and relax. On weekdays you will virtually have the entire beach to yourself! Our 2200 sq foot home neighbors all the finest properties on Oahu, just doors down from where the Obama family, Stephen Curry and Jay Z and Beyonce stay when they come to Hawaii. One of the very few properties that is actually a LEGAL vacation rental and has been since the 1990's, so you can be assured that your rental will be available when you arrive! Be a part of Hawaii's history by staying at this registered historic landmark. Pilipu Place offers the utmost relaxation and tranquility. Feel the white sand between your toes, bask in the warm Hawaiian sun, dive into the crystal clear aqua waters, and be glad you've made the best choice, Pilipu Place! Located steps from Kailua Beach, the best Beach in Hawaii! Our two story house offers Ocean and Mountain Views and the most luxury accommodations for the price! 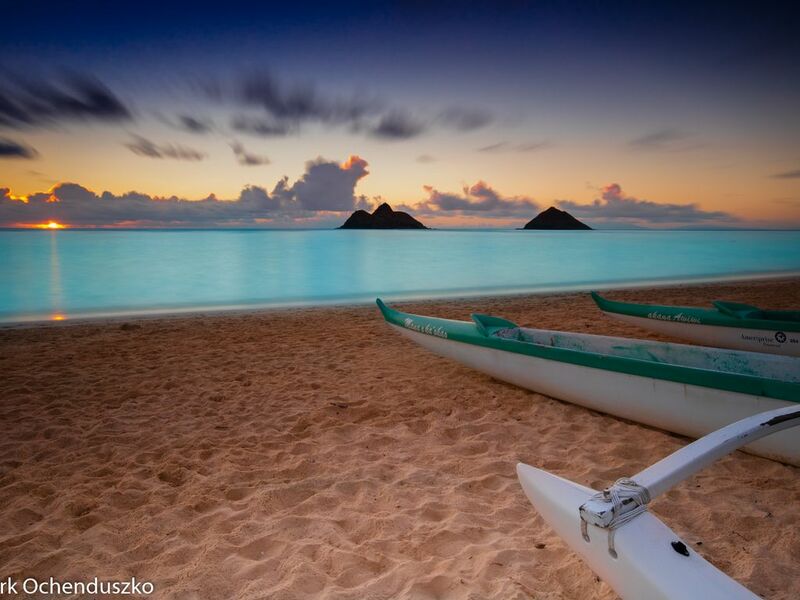 Escape to Kailua, a small beach town located just 20 minutes from Honolulu and Waikiki, truly away from it all! Our home underwent a remodel inside and out in 2013. It features all new furniture and bedding, high speed wireless internet, two flat screen tvs, fine furnishings, Hawaiian koa wood cabinets, marble, and crown molding. There is now an A/C unit in the master bedroom and screens on all bedroom windows. There are two large lanais one upstairs (with ocean and mountain views) and one downstairs. The house is situated on an acre of land, allowing ample room to lay out in the Hawaiian sun or let the kids play. The yard has beautiful plumeria trees, red hibiscus bushes, orchids, and of course, a coconut grove. Nothing is split or shared in any way. You have the house to yourself. We do not rent or live in any part of the house as some owners do. The house has one King bed, two queen beds, two twin beds and a pull out couch. It can comfortably sleep 10 total, 8 in beds and two on the queen pullout couch. It also has two full bathrooms. The master bedroom (king bed and a twin) and one full bathroom are located upstairs where the kitchen, dining room and living room are. The other two bedrooms and second bathroom are located on the first floor. The second bedroom has a queen bed and the third bedroom has a queen and a twin. There is also a queen sized pullout couch in the living room. The kitchen is stocked with everything you need to cook. It has a full sized oven, four burner cooktop, refrigerator/freezer, microwave, dishwasher, toaster and coffee maker. The kitchen has four barstools, perfect for hanging out while meals are prepared or for casual breakfasts. The dining room table seats six and there is also an outdoor patio set complete with tables and chairs with an ocean view. A full sized washer and dryer are located inside the house as well. You must see our VIRTUAL TOUR (www.bestbeach-hi.com), click Virtual Tour, and click the 'Cottage Living Room' and 'Cottage Balcony' buttons. You may also view the yard and beach on this tour. Keep in mind, however, the house has undergone a complete renovation and has new furnishings since the pictures in the virtual tour were taken. My parents own our lovely Kailua beach house. They purchased the property in approximately 1989 and my dad actually built the vacation rental beach house in 1991. We referred to our vacation home as the guest house when I was growing up and living in the main house next door. I manage the property for my parents and am lucky enough to visit yearly now that I live in Arizona with my husband and two children. The main house next door is a registered Historic Residence, built in 1928. It originally was the Mark A. Robinson family beach house, the family who has owned the island of Ni'ihau since 1864. When my dad built the guest house he mirrored the architecture and design of the main house. Staying on this property is truly enjoying a piece of history. Steps to the best white sand beach in Hawaii, you will have the entire beach to yourself on most days! Kitchen has Hawaii Koa wood cabinets and everything you need to cook amazing meals during your vacation! Various beach toys found outside the house as well as beach mats, chairs, umbrella, and snorkeling equipment. These items come and go so I can't guarantee what will be there during your stay. Two large patios, one upstairs with an ocean view and the other located outside the downstairs bedrooms. Outdoor hot and cold shower that comes out of a lava rock wall to rinse off at after a day at the beach! The location was exactly what we were wanting with only a 2 minute walk to the beach. The back yard was perfect for the 5 kids to enjoy when not at the beach. The house comfortably fits 8 people with 3 in two of the bedrooms and 2 in the third. The air conditioning was a bonus in the upstairs bedroom where grandparents were able to sleep comfortably. We definitely recommend this home for a relaxing vacation. This is a lovely property within feet of one of the most beautiful beaches on Hawaii. We were there with two other couples and this 3 bedroom, two bath home was perfect. It has a large lanai on the second floor, right off the kitchen/living room, which ensures a breeze and view of the ocean. It was very quiet, on a cul-de-sac and surrounded by lush vegetation. However, there are other properties in the area for the same price with better amenities. The furniture on the lanai is the cheap plastic furniture you can purchase at any box store and the livingroom and diningroom furniture is uncomfortable and needs to be replaced. We expected nicer finishes for the price we paid. Also, we expected the house was the only building on the property, but there is another house within 25 feet. It was no problem as the owners were not there, but it could be difficult. We did have a great time and were overall happy with the rental. However, we will explore another place for our next trip. We loved the home, the neighbors, the view! And we loved how close it was to the beach!! Because of this home and location and town, we had the best vacation we’ve ever had in all the Hawaiian islands! This property is amazing! Our family had such a great time, the house is a little older but totally worth it!!! Had everything we needed and it was just a few second walk to the beach, which I must say we had mostly to ourselves every day! The property owner was very helpful in suggesting close activities and stores, all the beach equipment my kids wanted was there for us to use! The price was good and we were able to cook our own meals which saved a lot for a family of 8! Highly recommend!!! Wonderful island experience with three generations of family. We made good use of the well equipped kitchen and the stock of beach toys. The kitchen and main living area is up a flight of stairs which was no bother for us, but could hinder some. The big grassy yard offers lots of sheltered and more shaded play area. The big second floor deck is great for reading or sleeping. We would love to return. Quiet Peaceful place to enjoy the beach! This home is a really cool historic property just one house back from the beach. We really enjoyed the gorgeous beach and the quaint town. There are so many hikes and beaches to explore that the list is endless. The house is a 3 bedroom home. I would say it is bigger than it looks in the pictures. It is truly a historic property so you need to keep that in mind when renting and appreciate that aspect of it. All of the neighbors are quiet and peaceful. It is a very fair rental price for the property. The owner was very responsive and helpful.